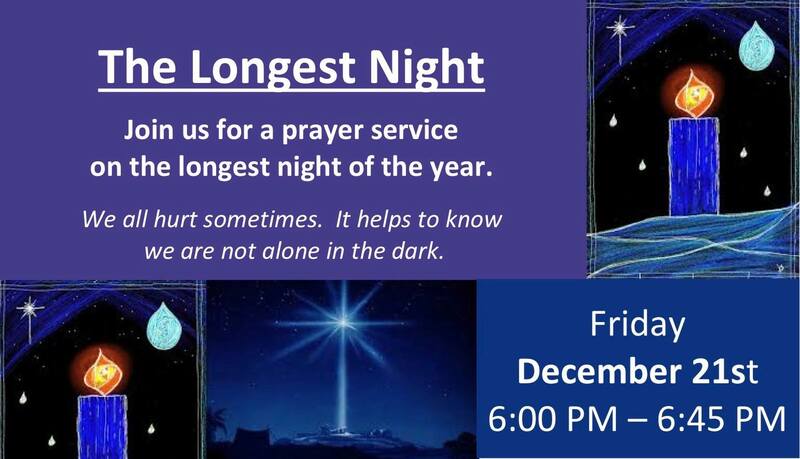 The Longest Night Friday December 21st from 6:00 p.m. – 6:45 p.m.
December 21st is the Winter Solstice which is the day of the year with the least amount of sunlight. This day can provide a time to step back from the hustle and bustle of the holidays. It’s a time to slow down and consider that Christmas is not always merry for everyone. We all hurt sometimes. It’s amazing how alone a person can feel amid all that celebrating. We need the space and time to acknowledge the whole range of our humanity. And we need to know that we are not alone. Drop in and join with us in praying, reading of scripture, anointing with oil, and music that acknowledge God’s presence is for those who mourn and for those who struggle. Come to stand by your brothers and sisters who are hurting.